We already know that OnePlus plans to bring two phones in 2019. One is expected to be the OnePlus 7, and the other is the yet unnamed OnePlus 5G phone. Now two pictures of the alleged OnePlus 7 Pro have been posted to Weibo (a Chinese social networking site) by IT station. One shot shows the phone's 'About' page and the other showcases the curved edges of the upcoming phone. If these pictures are authentic, this might be our first look at the upcoming 5G phone from the company. The 'About' page reveals a bunch of key specifications along with the model and build number. The name of the phone is stated as OnePlus 7 Pro but interestingly the inset photo being used here is that of the OnePlus 6T. It features a 6.67-inch Super Optic display, which is what the company is referring to its new screen tech as. The phone is powered by a Qualcomm Snapdragon 855 chipset and the variant in the picture has 8GB of RAM and 256GB storage. The Snapdragon 855 also gives the phone 5G capabilities thanks to Qualcomm's X50 modem. The pictures also reveal that the phone has been allotted a different model series, GM1915. Up until the OnePlus 6T, the naming that has been used to designate OnePlus phones has always started with the letter "A". According to the picture, the OnePlus 7 Pro will have three cameras consisting of 48MP, 16MP and 8MP sensors. There is no information about the selfie camera, but it is rumored that the upcoming OnePlus phone may have a pop-up camera for selfies. It is also revealed that the phone in question is running on Android 9 Pie with the build number 9.5.1 GM31CB. Generally, the about page on OnePlus phones also display the OxygenOS build, but the same isn't present in the leaked images. Coming to the second picture, the phone does not have any markings of a waterdrop notch and sports thin bezels on the top. The bottom bezels are slightly thicker and more noticeable. However, the most striking development comes as part of the screen, which is curved towards the edges. If that's the case, this will be a first for the company. This seems very similar to Samsung and Huawei's curved display implementation. 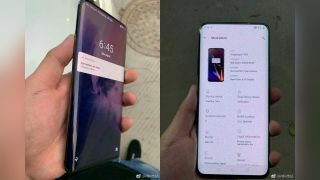 It is quite possible that the regular OnePlus 7 also has the same screen with curved edges. We'll know more as we near the official launch of the OnePlus 7, which we're expecting to hear about in the coming months.